All our diamond jewelry will come implied 3-month warranty covering against any manufacturer defects. Any manufacturer defects would be apparent in the 3 month time period. We have jewelers on site that can repair or if necessary replace the item. After the warranty period, we offer repair services at nominal pricing as a service to our customers. Shipping is not covered under warranty. Before purchasing fine jewelry and diamonds let help you know more about it. We all know diamonds are precious stone and we all love to purchase it. This will help you get the best diamond with confidence. Diamonds are rated and sold according to the 4 cs ie. Carat, Color, Cut, and Clarity. Let’s know more about each aspect in detail. This refers to absence of color in a diamond. A chemically pure and structurally perfect diamond has no hue and consequently a higher value. The colorlessness of a diamond is graded on an alphabetical scale from D (colorless) to Z (light yellow). CUT is the most defining characteristic of a diamond. The cut of a diamond refers not to its shape, but to the balance of proportion, symmetry and polish achieved by the diamond cutter. It is evaluated using the attributes of brilliance, fire, and scintillation. An expertly-cut diamond will achieve high levels of brilliance, sparkle, and durability. Even if a diamond is graded well in other areas, a poor cut can result in a dull, muted effect. Diamond Cut Scale contains 5 grades ranging from Excellent to Poor. Clarity refers to how clean or clear the diamond is with respect to natural microscopic characteristics that were trapped within or on the diamond while it was forming. Internal characteristics are known as inclusions, and characteristics on the surface of the gem are known as blemishes. Inclusions may be crystals of a foreign material or structural imperfections such as tiny cracks, known as feathers, which can appear whitish or cloudy. The carat is the standard unit of measurement used to indicate the weight of diamonds and precious gemstones. Total carat weight (t.c.w.) is a phrase that represents the total weight of all diamonds or other gemstones in a piece of jewelry, when more than one gemstone is used. Diamond solitaire earrings, for example, are usually quoted in t.c.w., indicating the combined weight of the diamonds in both earrings. Diamond shape refers to a diamond's physical form, and is often one of the first attributes that people consider when shopping for a diamond. In this, small diamonds are closely set together with minimal visibility of the tiny metal beads or prongs, allowing more light to reflect for incredible brilliance. Stones smaller than 0.01ct, in a pave setting, are considered micro-pave set. This classic setting features 2 or more prongs wrapped around the crown of the stone to secure it in place while also allowing maximum light to pass through the stone for maximum brilliance. In this, two or more stones are set together while each having 2 or more common prongs. This setting ensures maximum brilliance with maximum passage of light. This involves setting diamonds in a channel or groove in the metal. The stones are set side by side in a straight line with no metal in between. This setting is common for square or princess cut diamonds. Diamonds and gemstones sit side-by-side and create an illusion of a much larger diamond. A bezel setting has a metal rim that encircles the sides of a gemstone and extends slightly above it. A bezel setting holds a gemstone securely, and the protective profile it creates makes a bezel setting a good choice for people with active lifestyles. Because of it's excellent malleability and alluring glow, it remains the most popular metal for jewelry. Pure gold is called "24 karat," which means that 24 out of 24 parts are gold. 24 karat gold is rarely used for jewelry because it is too soft and easily damaged. Alloys such as copper and nickel are added to harden and increase the durability of gold. Yellow gold is available in different tones. The higher the percent of pure gold, the richer the color will be. White gold is actually yellow gold combined with a white metal such as palladium or nickel to give it a white hue. Even with white metals added, white gold still has a slight yellowish tint. To achieve a bright white appearance, white gold jewelry is often plated with rhodium. Bonded jewelry is manufactured with Sterling silver as the core metal and a sheet of pure Karat Gold mechanically affixed on top. The gold thickness, in bonded products, is greater than gold plated product and often permanent, making the product durable and long lasting. Bonded items at Jewelry Unlimited come with a layer of 10k gold and are often stamped as 1/10 10k or 1/20 10k meaning 1 of 10 or 20 fractions of the jewelry is 10k gold. Also referred to as gold plated jewelry, these pieces are created through a process where a base metal is covered with a very thin layer of gold by electroplating it. The quality of the base metal often determines the durability of gold plating. Majority of the gold finished items at Jewelry Unlimited comprise of sterling silver as the base metal making them a far more durable and sturdy choice. Insuring high-value personal property is a good idea, and your jewelry is no exception. Homeowner's and renter's insurance policies usually offer coverage for jewelry theft / damage. Carefully review your policy. Depending on the value of your collection, you might consider insurance specifically for your jewelry. An appraisal certificate is an easily understood document prepared by an expert gemologist that describes the key characteristics and quality of the diamonds and metal used on the jewelry/watches. The appraisal certificate can also be used for to purchase insurance as well as for upgrades or resell. All diamond jewelry $500 and up, purchased from Jewelry Unlimited, comes with an appraisal certificate. Various designer watches include an appraisal certificate from a certified diamond laboratory. Please refer to individual listings for availability and nature of certificate. All jewelry pieces require regular cleaning to maintain shine and brilliance. You can clean the jewelry at home with a soft brush and a soapy solution. You can also use readymade cleaning solutions or take services of a professional jeweler. It is important that the jewelry is stored individually in soft cloths or plastic Ziploc bags to keep from getting scratched and that it is removed while doing heavy work, housework or gardening. It is essential to avoid contact of jewelry with bleach, colognes, cosmetics and hair sprays etc. 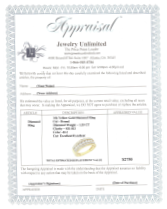 All diamond jewelry $500 and up, purchased from Jewelry Unlimited, comes with an appraisal certificate. Various designer watches include an appraisal certificate from a certified diamond laboratory. Please refer to individual listings for availability and nature of certificate. At Jewelry Unlimited, majority of the women's rings are available in size 7 and the men's in size 10. Most of these rings can be sized up or down to 3 sizes. The ones that can't be sized, are often available on custom order. Please refer to the individual listings for the details on sizes and contact us to know the cost in case re-sizing is needed. Please click on the link below to view a comprehensive chart for conversion for your ring size in the US size.